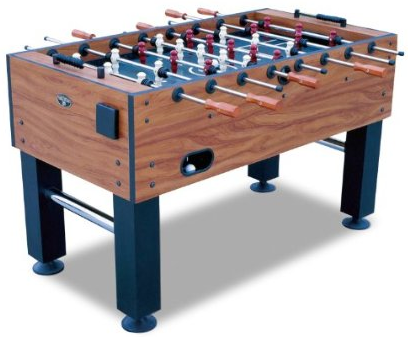 This FT250DS Attacker foosball table is a mid-grade table offered by the DMI Sports manufacturer. This table features some heavy construction on the table legs. The cabinet is made of medium density fiberboard (MDF) and includes oak veneer laminates for an attractive appearance. The table comes with 4 square legs and chromed finished leg cross bars for superior stability and leg levelers to ensure you can easily level the foosball table. Wooden handles, abacus style scoring system, and cup holders are also nice features on the FT250DS foosball table from DMI Sports. This foosball table is priced at around $425 US.